The average bag of mulch weighs 40lbs. Ergonomically correct handles of garden tools have been shown to reduce injuries. 60 minutes of steady gardening is closely equivalent to walking 10,000 steps or 5 miles. Gardening conditions the entire body and has been linked with better sleep, lower diabetes rates and fewer osteoporotic changes. If you get injured, seek the advice and treatment from a Physical Therapist. The sun is out, the sky is blue and you’re ready to get outside and enjoy the weather. After spending several months indoors, many people take advantage of warmer temperatures by working outside in their yards. If your body might is not prepared for the stress and strain, you may suffer for it. Here are several steps of preparation to help you enjoy yard work without injuries. 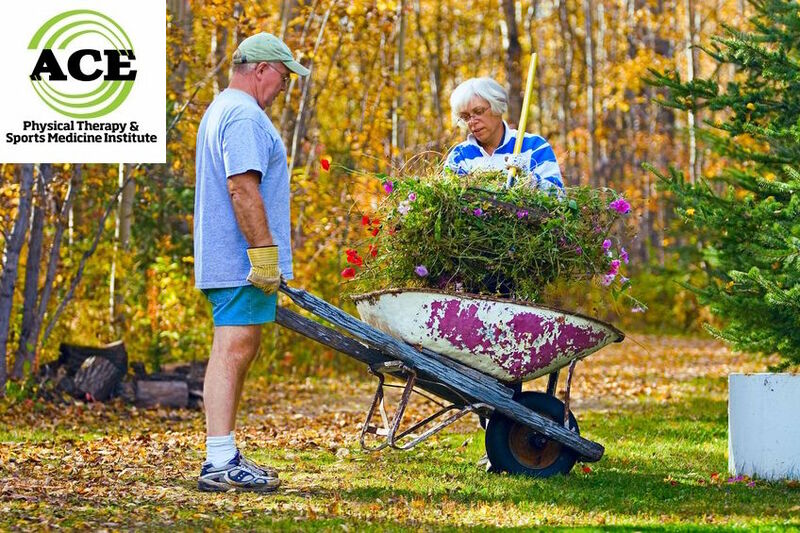 During the gardening season, you end up performing a variety of movements that are beyond daily activity like lifting, pulling, pushing and carrying bulky, heavy materials. If you fail to prepare for working in the garden or the yard, you are at risk of injuring nearly every part of your body. Some of the most common injuries involve the shoulders, elbows, low back and knees. There are several quick and easy to perform exercises that will help to prepare your body for the gardening season. When we are gardening, we often have to lift objects that are much heavier and bulkier than we are accustomed to lifting. Many times these objects need to be lifted in confined areas, on uneven terrain or in a way that is not conducive to using proper body mechanics. Poor lifting mechanics can lead to disaster and cause major injuries to the human body. If you are unsure of the proper way to lift an object from the ground level, you should seek the help and advice of a Physical Therapist. These healthcare professionals are some of the best at providing advice and teaching the proper techniques of lifting an object. They will be able to give you advice on ways to remain functionally sound and healthy as you navigate the various aspects of preparing your lawn and garden. Simple, easy to perform exercises that should help you avoid an injury. There is no fail proof way to totally eliminate the chance of hurting yourself, but if you are not prepared or under prepared you surely increase your chances of getting injured. The following exercises can be performed daily or at a minimum of every other day. They can be done in the comfort of your own home and do not require any special equipment. The exercises will address the areas of the body that are most easily injured while “working” in your yard. The goal of the routine is to prepare the muscles, joints and bones for the various stresses and strains that will be placed on them during the gardening experience. If you are experiencing pain or discomfort in a body part, go to a Physical Therapist prior to beginning the exercises to let them assess your condition. They will be able to help you modify the routine if necessary. Push ups: The Push Up position can be modified so everyone can perform this exercise. It is great to use to build strength in the chest and arms. The “proper” position is to be prone (face down) on the floor and rise up on your hands and toes. Nothing else should be touching the floor. Your elbows are straight and your hands are shoulder width apart. The push up exercise begins by lowering your body to the floor (don’t touch) and then “push” it back upwards to the starting position. You can modify this exercise by placing your knees on the floor throughout the routine. Pull-aparts: Stand and hold a piece of Theratubing (Rubber tubing can be purchased at most sporting goods stores or ask your Physical Therapist for a piece). Your arms should be at or near shoulder level and your elbows should be fully extended (straight). Slowly move your arms apart and stretch/”pull apart” the Theraband. Your goal is to get your hands spread apart with your elbows straight and in line with your shoulders. Your arms should remain parallel to the floor at all times. The final phase of this exercise is to take your shoulder blades and squeeze them together. You can use any weighted materials in your hands if you do not have any Theraband just be sure to move your arms slowly. Stress Ball Squeeze: Find a stress ball, sponge, ball of socks or a rolled towel and begin to squeeze it with all of the fingers. Be sure to incorporate all of the fingers and thumb and all of the joints. Rubberbrand Finger Extension: Place a rubberband (or several) on the ends of your fingers near the finger nails. Slowly spread your fingers apart and feel the resistance of the rubberband. Superman exercise: Lie prone (on your stomach) with your arms outstretched overhead. Slowly raise one arm and the opposite leg. Pause and then lower the arm and leg down. Trunk rotations: Lie on your back with your knees bent. Slowly rotate your knees to the floor to one side. Hold the stretch and then rotate to the other side. Hamstring stretch: Stand in front of a step. Put one heel on the step. Keep that knee straight and lean forward attempting to put your chest on that kneecap. All of these exercises can be performed at a rate of 15 repetitions for 2-3 sets per exercise session. You can always add more resistance by holding more weight in your hands as you perform the routine. Obviously, some of these exercises can be performed throughout the day and it will reduce the time that is needed to complete the routine. If you do suffer an injury while working in your garden, seek the advice and treatment of a Physical Therapist. These healthcare professionals can been seen without a doctor’s prescription and will be able to diagnose and treat your injury. 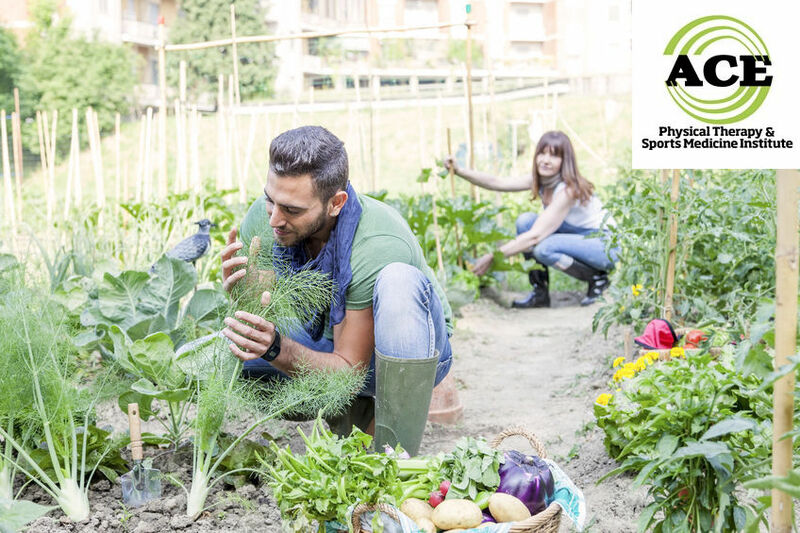 Gardening and “working” in your yard is enjoyable to a lot of people but the activities that are associated with the routine can cause injuries to your body if you are not prepared to perform them. Simple exercises can help to prevent injuries and allow you to enjoy this time of the year in your yard without getting hurt.